Flame Retardant polyester woven fabric used in the Company's production of organic phosphorus flame retardant monomer and polyester monomer retardant polyester chips produced by spinning, spinning and other technology to produce flame-retardant polyester filament, and (or ) staple fiber yarn as curtains and sofa fabrics, furniture and other decorative cloth fabric material to produce plain, twill, jacquard, chenille velvet various assortments, after bleaching or dyeing, dyed or printed from ʱ?? 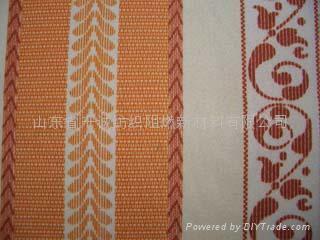 The fabric smooth, uniform, bright color, color fastness up to four. Width and structure: to OEM. According to customer demand. Permanent flame retardant, resistant to washing. Retardant effect will not wash and the sun and weakened. Soft, easy to color, high color fastness. Widely used in textiles hotels, hospitals, theaters, office buildings, high-end offices, exhibition halls, stadiums and other large public places. Train car ships and other transportation categories of textile products.